One of the highlights of Robert E. Howard Days every year is the wonderful Celebration Banquet that Project Pride throws for all the registered attendees. Along with the great Texas grub and fine dinner conversation, Guest of Honor Patrice Louinet will present a short talk about his involvement with REH. But, if a highlight can have a highlight, the REH Silent Auction is it! 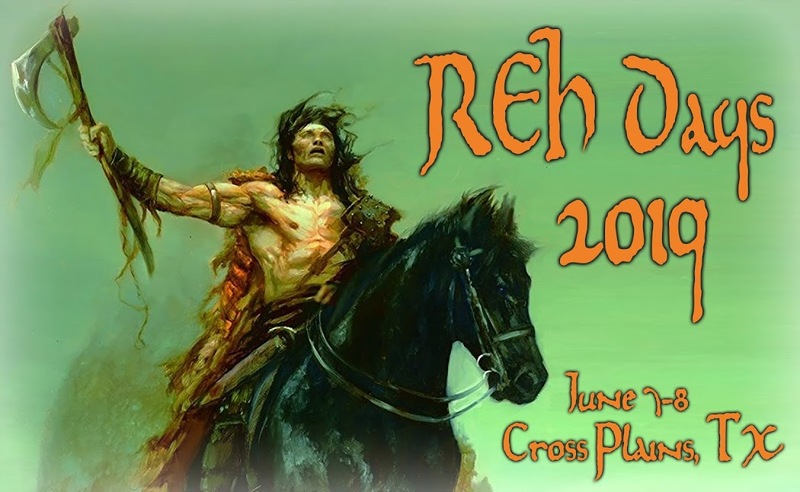 Held in conjunction with the dinner at the Cross Plains Community Center, the Auction features scores of Robert E. Howard items for your silent bidding. There is always a wide selection of unique and eclectic Howard items: books, magazines, fanzines, chapbooks, statues, posters, original art, videos & cd's, comic books and so on - an amazing array of Robert E. Howard stuff! Shown above is a relief carving I did a few years ago that has been recycled twice! (I bought it back for myself last year!) One year there was an original, large hand-drawn map of the Hyborian World and you will always fine some rare REH collectible among all of the esoteric offerings. You never know what will be there, which is a HUGE part of the fun - especially when friendly bidding wars ensue! But all this fun of a Silent Auction can't happen without your generous donation. Now's the time to go through your Howard collection and see if there's something you could donate to the Silent Auction. 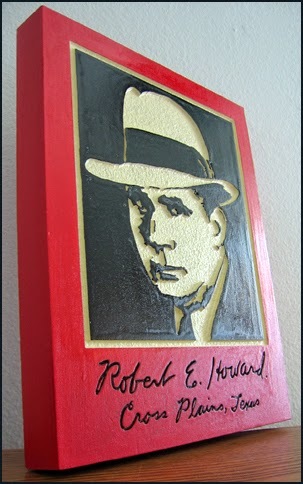 All of the money from the Silent Auction goes directly towards the upkeep of the Robert E. Howard Museum. It's a great way for you to not only share some of your extra Howard stuff with the world but you will continue to insure the Legacy of REH. Winner winner chicken-fried steak dinner! So, with eight weeks to go until Howard Days, now's the time to gather up those Howard items and send them to: REH Silent Auction c/o Project Pride, POB 534, Cross Plains, TX 76443. You'll be glad you did (the donations are tax-deductible), just not as glad as the folks doing the bidding!